Working the waiver wire is pivotal to succeeding in fantasy basketball. With so many games, injuries and endless shifts in rotations throughout the marathon campaign, we’ll need to source stats from free agency to maximize our rosters. In this weekly series, we identify players available in at least half of ESPN leagues at each position. Some of them are purely specialists, capable of helping in one or two categories. Others deliver more diverse and important statistical offerings. In the breakdowns below, I’ve ordered players at each position with priority of acquisition in mind. Darren Collison, Indiana Pacers (Rostered in 36.7 percent of ESPN leagues): While he won’t wow you in any single category, it helps his candidacy as a depth addition that Collison is averaging 52.4 passes during the past five games, tied with LeBron James and just ahead of Russell Westbrook during this stretch. The triumvirate of steals, assists and efficient scoring is what fantasy managers often covet from point guards. Collison provides this blend, albeit with modest enough scoring that he is rarely considered as a valuable utility addition. Yet, only eight players are averaging at least 9.0 points, 4.5 assists and 1.5 steals per game this season, with Collison among them. 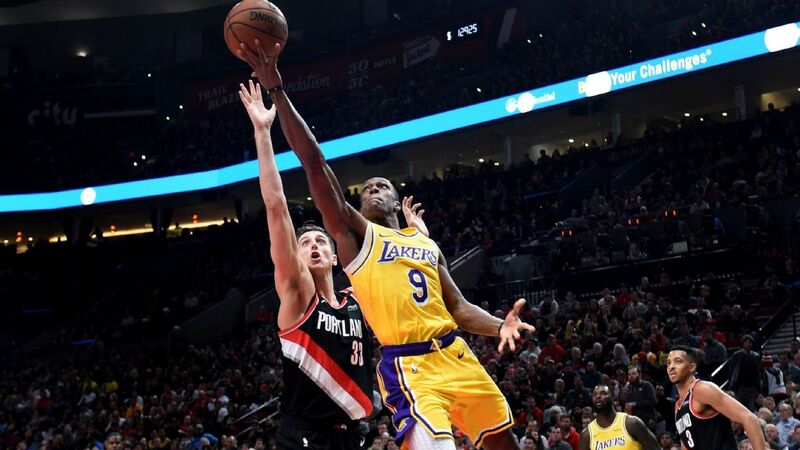 Rajon Rondo, Los Angeles Lakers (28.4 percent): Speaking of widely available distributors, Rondo is on par with Stephen Curry and Kyrie Irving, with roughly 49 passes per game and 10 potential assists per game. The complete list of players averaging at least 12.0 PPG, 7.0 APG and 5.0 RPG inlcudes James, Westbrook, Nikola Jokic, Ben Simmons, James Harden, Chris Paul and Rondo. Even with the expectation for his assist rate to dip a bit now that Lonzo Ball is commanding more usage, Rondo remains entirely roster-worthy in competitive 12-team fantasy hoops formats. Spencer Dinwiddie, Brooklyn Nets (10.8 percent): While it would be nice to see his assist production once again approach last year’s strong clip, Dinwiddie remains relevant as he’s lofting nearly six 3-point attempts per game and sinking them at a clean 40-percent rate. Averaging nearly 28 MPG and with a respectable 23.0 usage rate, Dinwiddie is a solid depth addition for those seeking both scoring and shooting pop. Deep additions (players available in at least 90 percent of ESPN leagues): Charlotte’s Tony Parker (0.8 percent) sports a healthy 26.1 usage rate and has taken 10-plus shots in five straight games. Wesley Matthews, Dallas Mavericks (10.6 percent): The addition of gifted distributor Luka Doncic to the rotation, along with his being another year removed from his Achilles injury, has only served to help Matthews’ offensive rise. Only Curry, Kemba Walker, Paul George, JJ Redick and Tim Hardaway Jr. are averaging more than Matthews’ 8.6 attempts per game from 3-point range. This year, Matthews is enjoying a 36 percent jump in scoring thanks to a 27 percent jump in field goal attempts, compared to his previous three seasons in Dallas. Malcolm Brogdon, Milwaukee Bucks (24.9 percent): A brilliant 72.2 true shooting clip during the past four games has Brogdon sporting an awesome offensive rating of 127 points per 100 possessions when on the court during this stretch. As an important complementary playmaker on a potentially elite Milwaukee offense, Brogdon can serve a similarly positive role for fantasy teams. Danny Green, Toronto Raptors (8.8 percent): There are currently three NBA players averaging at least one block, one steal and 2.5 made 3-pointers per game — Robert Covington, Josh Richardson and Green. We’ll discuss Covington below, while Richardson produced a career-high in scoring over the weekend and is available in roughly half of ESPN leagues. Enjoying career-bests in both efficiency and rebounding production, last year’s inefficient results can probably be written off due to his groin injury. Deep additions: E’Twaun Moore (2.5 percent) of New Orleans and Justin Holiday (2.0 percent) of Chicago are both getting up plenty of shots while earning steady minutes on their respective rosters. Robert Covington, Philadelphia 76ers (28 percent): It’s now my mission to get “Roco” rostered in at least 50 percent of ESPN leagues. After all, he earned first-team All-Defensive honors last season and now leads the NBA in steals. He’s also hitting nearly 45 percent of his attempts from beyond the arc. Over the past two seasons, Covington has led the NBA in deflections, signaling busy hands in the passing lanes. Last year, he also led the NBA in catch-and-shoot 3-pointers. Taurean Prince, Atlanta Hawks (24.3 percent): Some brutal recent shooting games don’t cast an accurate picture for Prince’s fantasy profile. He’s enjoying a rich 25.1 usage rate, tied with the likes of Kevin Love. He’s also ranked 20th in the NBA in 3-point attempts per game (6.8). Rodney McGruder, Miami Heat (23.2 percent): Ranked third on the Heat in points-per-touch behind only catch-and-shoot maven Wayne Ellington and hulking center Hassan Whiteside, McGruder combines scoring efficiency with a rich allotment of minutes. He currently sits at No. 22 in the league with 34.1 MPG. Deep additions: Houston’s PJ Tucker (2.3 percent) is a bankable target for a mix of steals, rebounds and 3-pointers. Pascal Siakam, Toronto Raptors (11.1 percent): One of several exciting young players on Toronto’s deep roster, Siakam has averaged nearly 33 MPG over the past four games — all starts — en route to 13.2 PPG, 7.8 rebounds and a very valuable 2.0 steals per game. Jae Crowder, Utah Jazz (6.0 percent): With at least four attempts from beyond the arc in every game and a sizable uptick in minutes over last season, Crowder is undeniably being underrated by the fantasy market. He’s one of just eight NBA players averaging at least 14.0 points, 2.3 made 3-pointers and 5.5 rebounds. It’s time to add Utah’s productive sixth man to rosters. Marcus Morris, Boston Celtics (14.3 percent): Quietly making his bid for “Sixth Man of the Year,” Morris is producing career highs in scoring (15.7 PPG) and rebounds (7.0 RPG) off the bench for the Celtics. Even though Morris is enjoying unsustainable shooting success (53.3 percent from 3-point range), it’s worth riding the hot hand until regression hits. Deep additions: The rare steals specialist at power forward, Indiana’s Thaddeus Young (7.1 percent) has averaged 2.3 swipes over the past seven days. Montrezl Harrell. LA Clippers (21.6 percent): Helping fulfill some of the high-percentage pick-and-roll work vacated by DeAndre Jordan, Harrell is taking a career-high 74.6 percent of his shots from within three feet of the rim. This shot distribution has led to Harrell making 62 percent of his total shots, helping fuel shooting efficiency for those in category leagues. When we factor in his 2.7 combined steals and blocks per game, Harrell has become a must-own fantasy contributor. Brook Lopez, Milwaukee Bucks (41.5 percent): Even when his shot from beyond the arc isn’t falling and the rebounding rate continues to prove lean, Lopez is proving to be consistent as a rim protector. He has at least one swat in all but one game, and multiple blocks in half of his appearances to date. Deep additions: In just shy of 21 MPG, Zach Collins is making nearly one 3-pointer while averaging 2.2 combined steals and blocks and nearly 11 PPG for the Blazers. … Atlanta’s Dewayne Dedmon is essentially a specialist for blocks, but is now also hitting a few 3-pointers to add some value.